A few days ago I was looking through the pictures of lunches made by my hubby for the past two weeks. He did not take many pictures but there are a few which are fun ones. 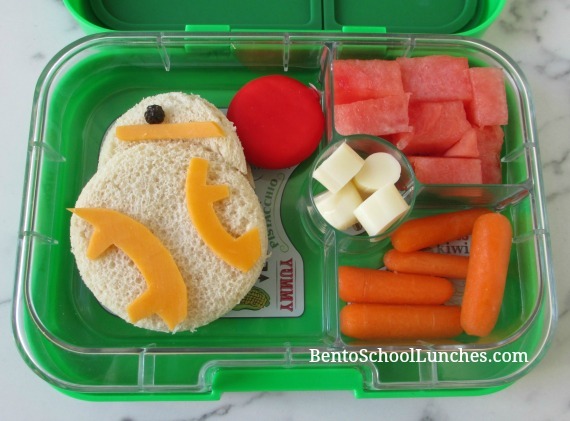 My favorite is this BB-8 bento which I think turned out cute and yet simple. One of the gifts that Nikolai received for Christmas from Santa was a remote control BB-8, with which both he and hubby frequently entertain themselves. Hubby made the BB-8 sandwich with two circle cutters and hand cut the accents from mild cheddar cheese then added a raisin to BB-8's head. He suggested that the red covering on the Babybel cheese could be a distant red dwarf star. Included with these are watermelon chunks, organic baby carrots and slices of a Mozzarella string cheese. This lunch was packed in a Yumbox. Here are the supplies that he used to create and pack this lunch. What a fun lunch, my kids would love this! Daddy did a great job! This is super cute! I love BB8 and this is totally adorbs!